The fitness wearables company needs to show that massive increases in spending can drive revenue and earnings growth this year. Fitbit (NYSE:FIT) is set to report its second-quarter results after the market close on Tuesday, August 2. The stock has tumbled over the past year, losing nearly 70% of its value on fears that the company's growth won't last. Fitbit produced impressive 50% year-over-year revenue growth during the first quarter and boosted its guidance for the full year, but exploding costs and slumping profits kept investor enthusiasm in check. Fitbit expects to report solid revenue growth during the second quarter, with its guidance calling for revenue in the range of $565 million to $585 million. That would represent year-over-year growth of about 44% at the midpoint, and sequential growth of 14%. The company's earnings guidance is another story. Fitbit expects non-GAAP EPS between $0.08 and $0.11 during the second quarter, down from $0.21 during the prior-year period. The company has been dramatically boosting its spending in an effort to stay ahead of the competition, and higher costs will eat away at Fitbit's earnings during the second quarter. At the end of the first quarter, Fitbit's R&D headcount totaled 755, up from just 295 one year earlier. This growth was reflected in the company's financials: R&D spending soared 222% year over year during the first quarter. Other costs rose as well, with sales and marketing spending jumping 144%, and general and administrative costs rising 175%. The result of this spending was a 77% drop in net income. New product launches were a major driver of Fitbit's results during the first quarter, and investors should expect an update on how the company's Alta and Blaze wearables are selling. Fitbit sold one million units of each during the first quarter, with the two new products accounting for nearly half of the company's revenue. The company's heavy spending, particularly on R&D and marketing, is critical for maintaining its competitive advantage, according to CEO James Park. On R&D, Park said during the company's first-quarter conference call that, "We feel that it will be difficult for many of our competitors to match the breadth and pace of our R&D over time." On marketing: "Our brand and marketing engine is a key Fitbit asset and competitive advantage driving market development, increased awareness, and brand preference." Fitbit expects to report full-year revenue between $2.5 billion and $2.6 billion, driven by new products churned out by its rapidly growing R&D staff. Non-GAAP EPS is expected between $1.12 and $1.24, up from $1.07 during 2015. In order to hit this guidance, Fitbit will need its new products to sell in the millions, driving enough new revenue to offset the company's current spending binge. Fitbit needs to show investors that its growth story remained intact during the second quarter, and that its heavy spending can drive earnings growth this year. 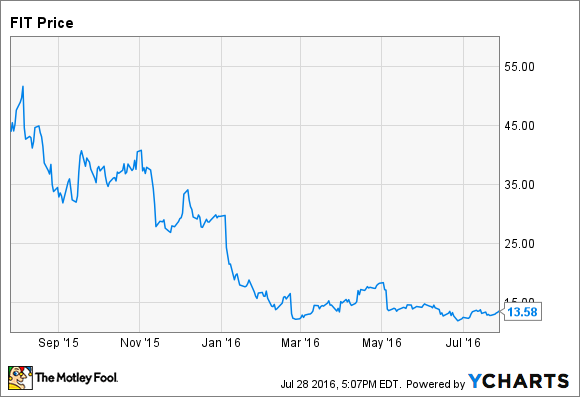 The specter of GoPro, another consumer gadget company, is no doubt contributing to the pessimism surrounding Fitbit. GoPro reported strong growth up until last holiday season, when revenue and profits plummeted on weak demand. In GoPro's latest quarter, revenue tumbled nearly 50%. Fitbit investors are hoping their company doesn't suffer the same fate.